Biodegradable Silk Floss is made from all natural, pure silk coated in candelilla wax. It contains no glutens, preservatives, GMO's, artificial sweeteners, colors or fluoride. 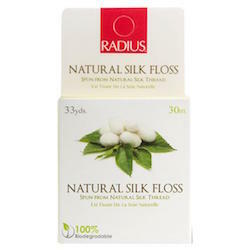 Radius Silk Floss is completely biodegradable. Directions: Wind a piece of floss around your middle fingers, leaving about 4" between them. Grasp floss firmly between thumb and index finger and slide between teeth, curve floss around tooth and move up and down. Repeat for each tooth. Ingredients: Pure Silk, Candelilla Wax. You won't find glutens, preservatives, artificial sweeteners, GMOs, unnatural coloring, phthalates, parabens, or any other harmful additives in our floss. Ever.